TEDDY is a sweet 4 year old Boxer/Bully mix male who was living life on a chain, neglected and abandoned. The rescue was contacted to help because Teddy was emaciated and in need of medical care and his owner was no longer there. He was rescued and has been off the chain and in a safe, loving foster home ever since. He was only 44 pounds when rescued but he has regained weight and has received the care and treatment needed to get back to being a healthy dog, ready to find a new home. He tested positive for heartworm but has completed the treatment needed to rid him of heartworms. He has been vaccinated, neutered, and microchipped. If you live in another state, don't let that stand in your way. 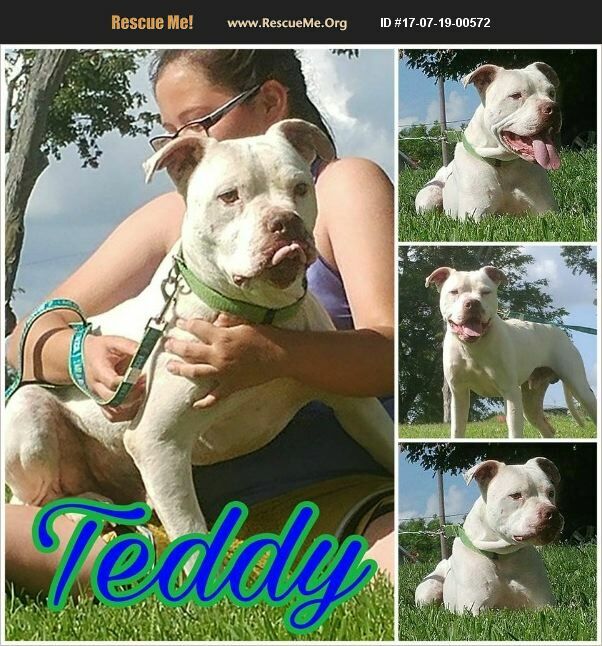 We will work to transport Teddy if it means he will have a good forever home. If you are another rescue group, we will waive the adoption fee but you can make a donation toward vetting at your discretion. The adoption fee will help our 501(c)3 non-profit, all-volunteer rescue to cover at least part of the cost of the veterinary care this dog has received.